Life behind a desk isn't for everyone. Here's how one creative builder traded his in for a worktable. 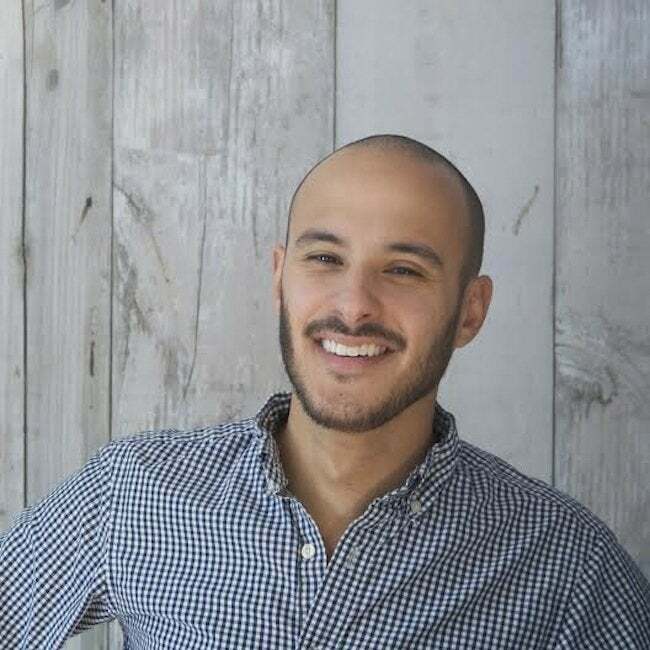 When Jeremy Medow left behind life on Wall Street for a new start in Connecticut, he didn’t know that he would end up building clocks for a living. But now he’s lucky enough to do just that, in addition to crafting lamps, custom furniture, and a host of other products under the name Tungsten Customs. As someone who had a lifetime of experience with electronics and computer programming, learning how to combine circuitry with woodworking came as second nature—and produced beautiful results. We caught up with Jeremy to learn more about what makes him tick. I understand that Tungsten Customs started as a hobby. Can you tell me about that? I actually went to school for math, and I worked on Wall Street for seven years. Eventually I left because I was just not really feeling that anymore. When I left, I wasn’t quite sure what I was going to do. I realized that I had kind of always been tinkering and building things. 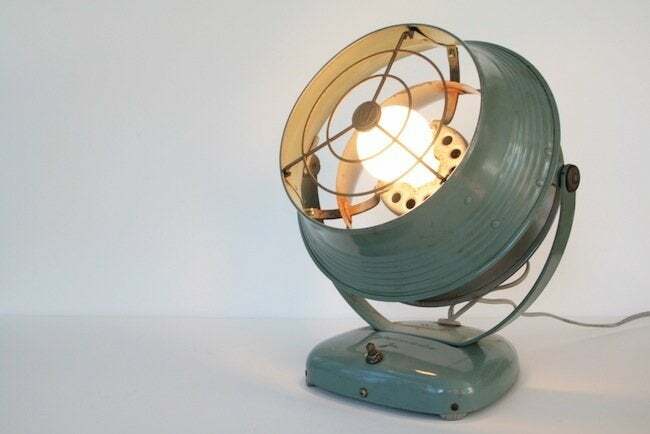 I had (to some limited extent in my Manhattan apartment) built a few lamps out of old vintage pipe fixtures, and I realized that I enjoyed doing that—I liked physically making things. So I thought that I might as well give that a go as a business. I’m more or less working 50 hours a week in my own workshop. It’s fun. The work I used to do was very intellectual and societally not very useful. It’s not that what I do now is any more useful, but I make something and then somebody buys it and they enjoy it. It’s a nice feeling to take raw materials and then turn them into something more functional and more beautiful. 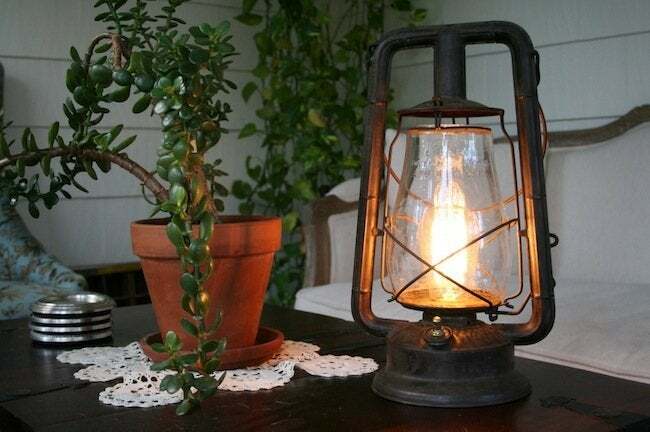 At first I was just buying old railroad lanterns on eBay. I took out the wick and the oil tank, added a lamp socket and a switch, and upcycled them into incandescent lamps. I quickly moved away from that. I liked upcycling things, but it was a bit trendy. Plus, I liked the idea of making things from scratch a little more. So I started moving into furniture first, and then, about a year in, I realized that I wanted to introduce electronics to the business. That’s when I launched my first clocks. 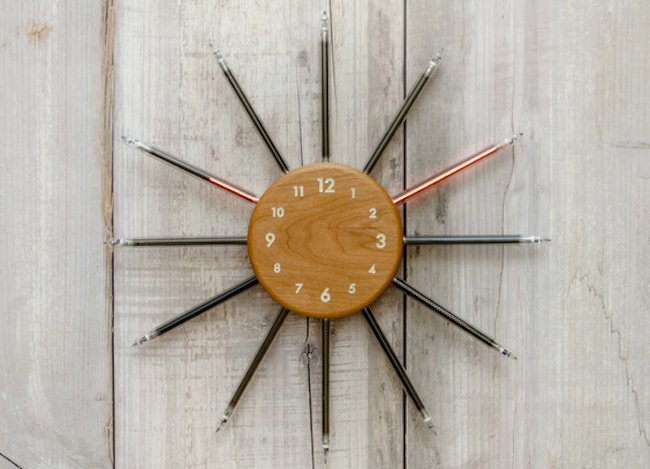 How was making a clock different for you? The woodworking part is relatively distinct from the electronics part. I had always known a little bit about electronics, and I found a lot of resources on the Internet. My nixie tube clocks use the old vintage tubes that were produced 40 to 50 years ago. You can buy premade circuit boards to power them, but I decided that I wanted to do it all myself. So I learned how other people did it, and then I sat down and designed my own circuit boards. I had them printed by another company, and I bought the components and did all the soldering myself. Only now have I outsourced all the creation of the circuit boards and the assembly—that’s now being done at an assembly plant in Massachusetts. For the first couple hundred clocks, though, I did all the soldering myself. At the same time, I would go get the lumber, plane it, rip it, joint it, cut down blanks, router out the insides, and then do lots and lots of sanding for finishing. So the clocks were sort of created in two parallel streams, and then at the end I would just attach all the circuit boards, buttons, and plugs, and put it all together. What attracted you to the idea of using nixie tubes? 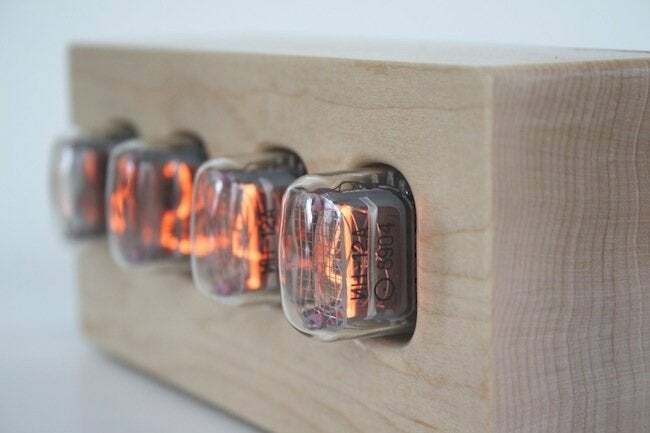 I came across nixie tube clocks on the Internet—like so many other things. And I’m absolutely not the first person to make nixie tube clocks, but for whatever reason the material seems to attract people who have a very different aesthetic than I do. Most of the nixie tube clocks that I found were made from laser-cut acrylic or metal and they just looked geeky, for lack of a better word. 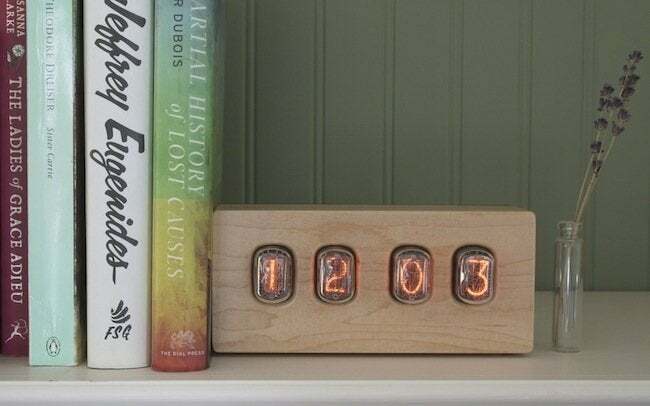 I like midcentury modern design a lot, so I thought that because nixie tubes are from that era and they have a nice incandescent glow, that they’d look better set in wood. That’s how I had the idea to start making those. What were your early clocks like? 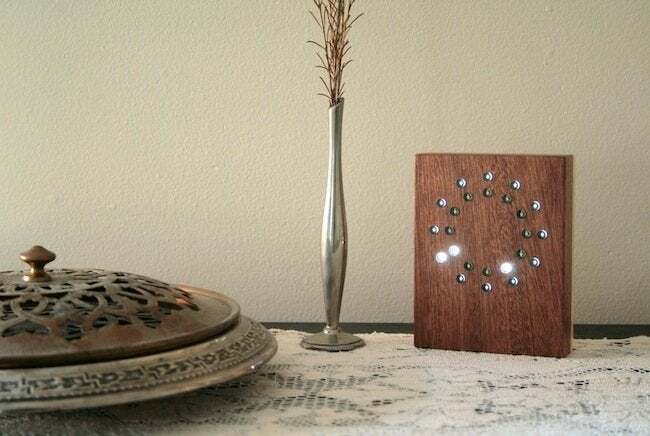 The first clock that I wanted to make was a nixie tube sunrise alarm clock. My wife was waking up early for school at that point and she said to me, “Hey, can you make me one?” and I said, “Yeah, probably.” There’s no audible alarm, but when the timer is hit, the light bulb slowly dims from off to on, so it simulates the sunrise. It’s a lot more pleasant to wake up slowly with light than it is to wake up to a blaring alarm at 5 a.m.
What have you learned about building things since you started? It’s remarkable to me how much the quality of my goods has improved simply by improving my process. It looks as if I hadn’t discovered sanding yet when I first started, and now my products look a lot more polished. One important thing I did early on was figure out template routing. So rather than use crude hand-cut templates (which were then clamped onto the wood), I figured out a way to design a laser-cut acrylic template that I could weld together. It gives me a much firmer hold on the workpiece. Now I can create more product quicker and at a much higher quality than I would otherwise be able to do. I noticed you had a new clock on Kickstarter. Is that what’s next for you? The Kickstarter campaign finished successfully a couple of days ago, and I just started production on them. It’s a passion project for me. 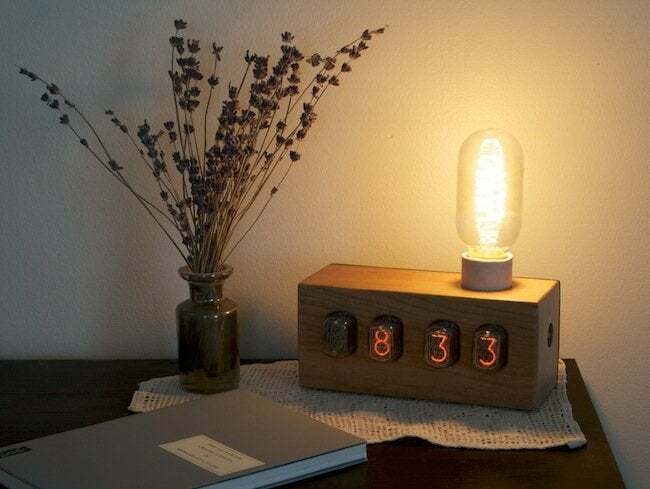 I had always wanted to use the nixie tubes to make an analog clock, but could never figure out how. Then I saw those long nixie tubes, and it dawned on me in one of those half-asleep moments that that’s how I would do it! They should be made and ready to order in the next two to three months. To find even more amazing clocks, or to commission a custom piece, visit TungstenCustoms.com.